Advice: Investors may BUY with a 1 year perspective. Overview: ETech is the largest 2 and 3-wheeler auto component manufacturer in India, with 25 plants across India, Italy and Germany. ETech had revenues and profits of Rs 5,241 cr and Rs 291 cr. resp. in FY16. Its revenue, EBITDA and PAT have grown 8.1%, 7.8% and 12.4% CAGR from FY12 to FY16. ETech has a significant size, improving margins and marquee customers. It has a healthy balance sheet indicating conservative financials. It has good Indian and global presence. It is not well-known, but with this IPO it may emerge among the leading firms in the segment. At a FY16 PE of 22.8 times, the pricing & valuations leave something on the table for investors. Negatives include sector high competition, cyclical business and currency & global biz risks. Overall, ETech is a good offering and is a high stamina player in the auto ancillary space. As an investment, the ETech IPO is rated a medium risk, high return type of offering. Outlook: Investors can go ahead and BUY this ETech IPO with a 1 year perspective. Here is a note on Endurance Technologies (ETech). IPO opens: Wed 5-7th Oct 2016 with Issue Price band: Rs. 467-472 per share. Shares offered are 2.46 crore nos of Face Value Rs. 10 per share and the market Lot is of 30. Shares offered are 17.5% of equity. The IPO will raise Rs 1,162 cr. (upper band) which is a sale by promoter Mr Anurang Jain and investor Actis; there is no fresh issue of shares. So the IPO does not benefit the company directly. The promoter of ETech is Mr Anurang Jain who holds 62%. Actis also holds 14% stake. The IPO shares are available to institutional, non-inst. and retail in ratio of 50:15:35. Post IPO shareholding will be Anurang Jain 58%, Naresh Chandra 12%, Suman Jain 12%, IPO QIB 9%, IPO retail 6% and IPO NIB 3%. Actis is completely exiting. ETech is one of the largest 2 & 3 wheeler auto component manufacturer. It had revenues and profits of Rs 5,241 cr and Rs 291 cr. resp. in FY16. Its revenue, EBITDA and PAT have grown 8.14%, 7.83% and 12.42% CAGR from FY12 to FY16. ETech has 25 plants across India, Italy and Germany. The 18 plants in India are located in the auto belts, comprising Aurangabad (8), Pune (5), Pantnagar, Uttarakhand (2) and 1 each in Manesar, Chennai and Sanand. Also, ETech has plants in Germany (2), and Torino, Italy (5). ETech is also setting up a new plant at Halol (Gujarat), possible completion in FY18; a new plant in Germany (FY17) and are planning an auto proving ground (test track) in Aurangabad. Utilization levels in current plants appear in the 20-30% range, indicating growth will be easy. ETech is a tier one supplier for most of their products, and supply directly to OEMs. For FY15, FY16 and Q1 FY17, their revenue contribution from India was 71.5%, 70.1% and 66.8%, resp., while the contribution from Europe was 28.5%, 29.9% and 33.2%, resp. Aluminium castings and alloy wheels. Suspension components: Shock absorbers, Front forks and hydraulic dampers. Transmission components: Clutch assemblies, friction plates and CVT’s. Braking Systems: Hydraulic disc brakes, rotary disc brakes and hydraulic drum brakes. In India, ETech manufactures auto components for the 2 & 3 wheeler segments. In Europe, they mostly cater to four-wheeler OEMs, focusing on engine and transmission components. In FY16, ET’s large customers in India were Bajaj, Royal Enfield, Honda Motorcycle and Yamaha. Baja Auto is their largest customer. In addition they supply other OEMs in India, such as Hero, Mahindra, Tata, Suzuki, H-D Motor and Fiat India. In Europe, their largest customer is FCA Italy S.p.A., who in turn supply to Jeep, Chrysler, Alfa Romeo, Abarth, Fiat, Lancia and Daimler. They also supply a few other four-wheeler Europe OEMs. According to the Aluminium Casters’ Association of India, they are the #1 aluminium die-casting firm in India in terms of actual output and installed capacity in FY16. ETech is an innovation-driven company with a focus on R&D, which allows them to develop new products suited to customer requirements. ETech’s R&D process includes design, development, validation, testing, manufacturing, delivery and aftermarket sale service. ETech has been successful in diversifying their products due to their R&D and technology capabilities. Their tech partners include WP Performance Systems GmbH a leading global brake and suspension firm and Adler SpA, a European brakes technology provider. They employ 167 R&D engineers, designers, technicians and support staff in India & overseas. In India, ETech has been granted 4 patents with another 41 patents pending approval. They also have 1 design registration granted and 3 design registrations pending. ETech’s long-term bank facilities are rated CRISIL AA-/Positive and short-term are CRISIL A1+. Over time, ETech has grown organically in India, including consolidating its promoter’s companies into one firm. ETech diversified its capabilities by introducing suspension products in 1996, transmission products in 1998 and braking systems in 2004. Starting from one mfg. facility in 1985, they have grown to now operate 18 facilities in India. The management of ETech in Feb 2016 discussed their five-year business plan in which they are targeting a turnover of Rs 10,000 cr. for ETech by 2020, obtained through organic growth. ETech is banking upon advancements in product technologies such as braking (combined braking systems (CBS / anti-lock braking systems) and suspension systems (adjustable damping front forks) for growth in the near and medium term. According to ETech, mandatory legislative requirement for ABS of 125cc and above 2-wheelers is good news for ETech as scooters is a growing segment. Mr Naresh Chandra is the father of Anurang Jain, and holds 12% stake (pre and post IPO). Thus ETech is a family controlled business which has a structure in which the family would continue to control 82% of the business (post IPO). Mr Rahul Bajaj (Chairman of Bajaj Group) is the maternal uncle of Mr Anurang Jain. Bajaj Auto was the only client of ETech until 2004. Actis is a leading private equity investor in growth markets across Africa, Asia and Latin America. It had invested Rs 372.5 cr. in ETech 5 years ago buying equity from StanChart PE. The cost of acquisition per equity share for Actis was Rs 190.8. They will gain 147% in 5 years from the IPO. ETech had prepared for an IPO in 2011 but perhaps opted for Actis PE instead. The unofficial/ grey market premium is in the range of Rs 60-65. This is a positive indication. In FY16, auto production in India was 2.45 cr. with 2-wheelers (motorcycles, mopeds and scooters), accounting for over 75%. India’s 2-wheelers industry revenue was Rs 82,000 cr., with a production of about 1.9 cr. 2-wheelers growing at a moderate 5.1% CAGR from FY12-16 mainly due to two years of bad monsoon in 2014 and 2015. India’s 3-wheeler industry comprises of passenger three-wheelers and cargo three-wheelers. Industrial demand is a key growth driver for the three-wheeler industry. It is expected that consumption would pick up in FY17 with lower commodity prices, inflation and softer interest rates. Currently the capacity utilization is low and these factors will prove to be the growth trigger. Rapid technology changes are taking place in automobiles with demand for fuel efficiency, lightweight bodies and a shift from fossil fuels to electric/ renewables. 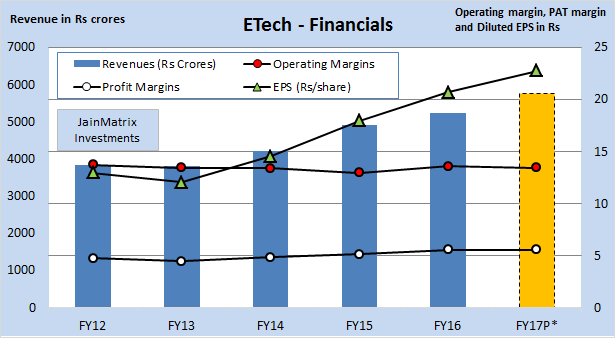 ETech revenue, EBITDA and PAT have grown 8.1%, 7.8% and 12.4% CAGR from FY12 to FY16. (Note: The projected FY17 data is a simple extrapolation from the Q1 FY17 results). See Fig 4. The revenue growth is moderate, and margins have been stable to improving over the years. ETech has free cash flows in 4 out of last 5 financial years. This is a positive. Fig 5. ETech has generated high ROE of 20% (FY16). The dividend growth in 5 years has been good considering the cyclical of the nature of the business. Fig 5. The cash per share including Reserves & Surplus and Cash on Balance sheet as on June 2016 is Rs 114/share. So operations of ETech are available at (472-114) = Rs 358/share (at UMP). We benchmark ETech against Indian listed peers, See Exhibit 6. ETech seems to be fairly priced in terms of P/E and P/B, about 30-40% cheaper than the leaders, Motherson Sumi and Bharat Forge and similar range as Sundaram Clayton. On growth parameters and margins, ETech is fair. Debt is medium and in control. Consistently high RoE and RoCE is a positive. Dividend yield is also impressive in comparison. With an IPO, ETech may achieve visibility and recognition putting it on par with well-known leaders. IPO pricing and valuations look reasonable. ETech has a consistent track record of organic and inorganic growth. It has strong customer relationships with high quality OEMs in India and Europe. ETech offers products in 4 broad segments which helps to expand customers relationships. ETech has strong R&D and technological capabilities. It has invested in high-quality testing equipment, software, human resources, in its R&D centers for each of their product segments. The balance sheet looks healthy with good cash/share and fair debt. The firm is led by a team with good experience in the auto component industry. The MD has been in the industry since 1985. The next line of management has experience in their respective areas, and have been with ETech for over 5 years. Executive compensation is high but fair compared to profits. The firm has successfully executed a large overseas acquisition in Europe and gained as customers reputed OEMs, and has a fast growing and profitable European business. Auto ancillary sector is considered a working capital and asset heavy business. New orders involve big additions to working capital, so ETech has to manage growth and financial health. Competition is high in this space and ETech may get pressured on price or margins in future. ETech is subject to environmental and safety regulations that may adversely affect business. ETech’s business is dependent on certain principal customers, especially Bajaj Auto in India and FCA Italy S.p.A in Europe. Sales to their top 3 customers was 65.3%, 61.8% and 62.1% of their revenue for FY14, FY15 and FY16 resp. However this is a typical auto B2B situation. Their success depends on the success of the models launched by OEMs. Thus several key success factors for Tier-1 suppliers are out of their control. The cyclical and seasonal nature of auto sales and production can adversely affect business. As a primarily Tier-1 supplier to OEMs, ETech may be exposed to price and demand squeeze during cyclical slowdowns. In comparison, the replacement/ aftermarket business is typically much steadier and more profitable, while being smaller in size. Forex fluctuations and international issues could negatively impact their business. Current expectations are that the domestic market’s current uptrend will continue for 2-3 years. However if it slows earlier, domestic business will be affected. Indian auto ancillary mfg. is a high potential space with ample domestic demand and global opportunities. India has many competitive & comparative advantages. Two wheelers and small cars – R&D and manufacture will shift here with many global players already present. ETech has a significant size, steadily improving margins and marquee customers. It has a healthy balance sheet with conservative financials. It has good Indian and global presence. It is not well-known, but with the IPO may emerge among the leading firms in the segment. Current equity market conditions are positive for IPOs, and auto-ancillaries is a good sector. At a FY16 PE of 22.8 X, valuations appear right and leave something on the table for investors. The negatives include high competition, cyclical sales and currency & global business risks. Overall, we feel that ETech is a good offering and is a high stamina player in the auto ancillary space. As an investment, the ETech IPO is rated a medium risk, high return type of offering. Investors can go ahead and BUY this ETech IPO with a 1 year perspective. This document has been prepared by JainMatrix Investments Bangalore (JM), and is meant for use by the recipient only as information and is not for circulation. This document is not to be reported or copied or made available to others without prior permission of JM. It should not be considered or taken as an offer to sell or a solicitation to buy or sell any security. The information contained in this report has been obtained from sources that are considered to be reliable. However, JM has not independently verified the accuracy or completeness of the same. JM has no known financial interests in Endurance Technologies Ltd. or any group company. Neither JM nor any of its affiliates, its directors or its employees accepts any responsibility of whatsoever nature for the information, statements and opinion given, made available or expressed herein or for any omission therein. Recipients of this report should be aware that past performance is not necessarily a guide to future performance and value of investments can go down as well. The suitability or otherwise of any investments will depend upon the recipient’s particular circumstances and, in case of doubt, advice should be sought from an Investment Advisor. Punit Jain is a registered Research Analyst under SEBI (Research Analysts) Regulations, 2014. JM has been publishing equity research reports since Nov 2012. Any questions should be directed to the director of JainMatrix Investments at punit.jain@jainmatrix.com.